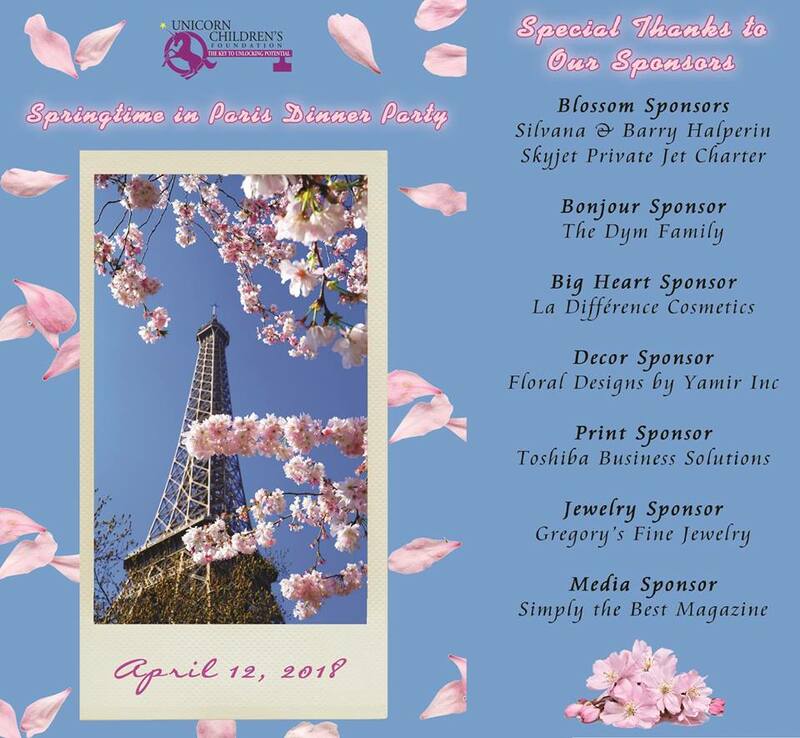 On Thursday April 12th, 2018, The Unicorn Children’s Foundation, along with event chair Gwen Taylor hosted its first ever Springtime in Paris, a Paris themed luxurious dinner at the esteemed Indian Creek Country club in Miami Beach. The Foundation is proud to announce that it was able to raise over $90,000 to support cradle to career initiatives that will help kids with special needs excel in their communities! Guests were treated to special performances of a pianist and singer, an amazing assortment of French cuisine, and a great assortment of Silent and Live Auction items. The evening featured the induction of Mrs. Sarah Gephart and Mrs. Connie Russell into the Unicorn Children’s Foundation Visionary Society, an exclusive club that recognizes extraordinary women who are united by their acts of generosity to help kids with special needs and their families. Members inducted into this society are presented with an exclusive gold Kaufmann de Suisse unicorn pin featuring a brilliant diamond eye, representing a beacon of hope. The evening also featured a heartwarming speech by a Unicorn Village Academy student with special needs who shared his aspirations with guests and explained how his dreams are being made possible through the Academy and the generosity of Unicorn supporters. When asked what he hopes will happen for his future he stated: “I hope to get a job and make lots of money and make someone happy every day”. Unicorn would like to thank all of its Sponsors & supporters, without whom this event would not have been possible, including; Simply the Best Magazine, Gregory’s Fine Jewelry, Floral Designs by Yamir, Skyjet Private Jet Charter, La Différence Cosmetics, Silvana & Barry Halperin, Toshiba Business Solutions, The Dym Family, and Yvonne Eldredge and Emily Damiano. Unicorn Children’s Foundation is a non-profit organization providing education, awareness and funding opportunities to organizations for special needs children in an effort to help them excel in the community. For millions of special needs children with developmental, communication and learning challenges, finding a cure is like chasing a rainbow in that a cure remains elusive. The Unicorn Children’s Foundation is expanding the collective special needs community to help acknowledge, celebrate and integrate the special qualities possessed by neurodiverse children with Autism, ADHD, Bipolar, Asperger’s, Dyslexia and other learning disorders. The Academy was funded as an initiative of the Foundation 5 years ago, and is a community based, 5 year life skills, academic, and career high school for youth ages 13-22 with developmental and learning challenges. It works to provide a safe and dignified learning environment for students to explore and realize their true abilities and potential, and helps them to develop the necessary skills to successfully transition to work, college, and independent living, while also allowing the opportunity to live out their own dreams and fully engage in the community in which they live.